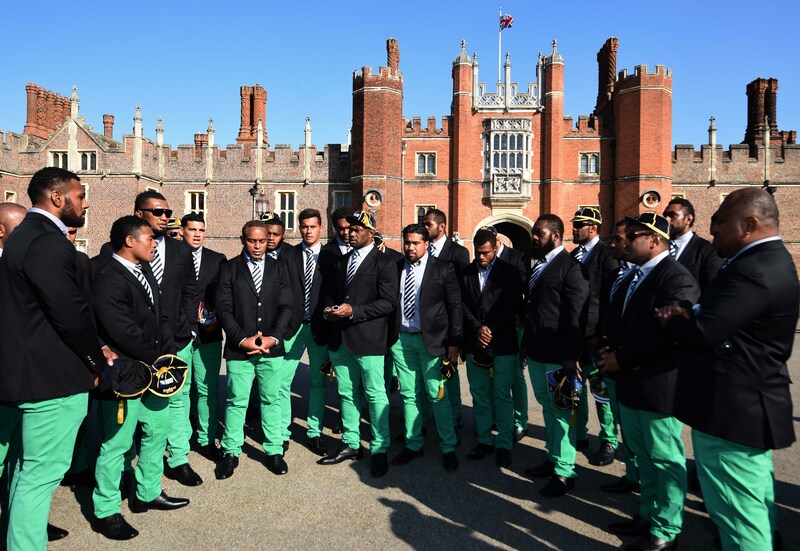 Members of the the Fiji 2015 World Cup Rugby Union squad sing outside Hampton Court Palace. The first of 20 ceremonies welcoming tournament teams was held today as Fiji answered a song by an Essex choir with their own musical number. The Fijians meet host England on Friday, Sept. 18, at Twickenham stadium in the first game of the tournament. Today the Pacific Island team members were at Hampton Court Palace for speeches, the reception of tournament hats and medals and music, sung to them and by them. According to the England Rugby 2015 news release, a choir from Thurstable School at Tiptree, Essex, performed “World In Union” in front of rugby officials, the player’s families and the local community. After the ceremony, some of the Fiji team decided to answer with their a rendition of a traditional Fijian hymn. The Fijians posed with tourists for photos and looked ahead to next Friday’s game. Fiji is in what is considered the toughest of the four pools. Besides the match against England, they will play Australia, Wales and Uruguay. The welcome ceremony for the United States Eagles is scheduled for Sunday in Portsmouth. Posted on September 10, 2015 September 11, 2015 by jbsaulPosted in Rugby, SportsTagged Fiji, rugby, Rugby World Cup, RWC.